(2) If, in a moment connection, a contact force on the compression side counterbalances the applied tensile force no reduction in slip resistance is required. (1) As an exception to 2.4(3) , preloaded class 8.8 and 10.9 bolts in connections designed as slip-resistant at the ultimate limit state (Category C in 3.4) may be assumed to share load with welds, provided that the final tightening of the bolts is carried out after the welding is complete. (1) Deduction for holes in the member design should be made according to EN 1993-1-1. 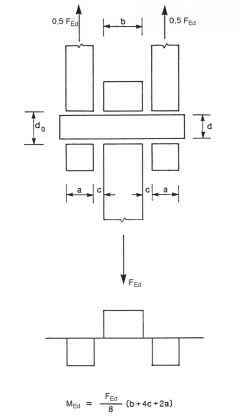 (1) Block tearing consists of failure in shear at the row of bolts along the shear face of the hole group accompanied by tensile rupture along the line of bolt holes on the tension face of the bolt group. Figure 3.8 shows block tearing. 6nt is net area subjected to tension; 6nv is net area subjected to shear.